Throughout the ongoing assault on the Gaza Strip, perhaps no phrase has featured as prominently or persistently in the lexicon of Israeli propaganda as “human shields.” Repeated in stentorian fashion by Prime Minister Benjamin Netanyahu and a heavily regimented army of 10,000 public relations flacks, the phrase has been ruthlessly deployed to shield Israel from responsibility for the bloodbath it has caused in Gaza. Israel has killed 1,800 civilians in a matter of weeks, including some 430 children, but it was Hamas that forced them to do it. Like so many Zionist accusations against Palestinian society (“They only understand force,” “They teach their children to hate,” “They never miss an opportunity to miss an opportunity”) the human shields slander is a projection. Israel is the most militarized society on earth, with soldiers and military installations honeycombed throughout its civil society. With full military conscription for all men and women and reserve duty required for all Jews until they reach their 40s, Jewish Israelis alternate constantly between the role of civilian and soldier, blurring the line between the two. headquarters, a gigantic complex of monolithic buildings that house the offices where attacks on Gaza are planned. The uniformed officers and soldiers who work inside take lunch in the cafes and shop in the malls surrounding their offices, embedding themselves among the civilian population. A military base is nestled in the middle of the campus of Haifa University while Hebrew and Tel Aviv Universities offer military officers free tuition, encouraging their enrollment and allowing them to carry weapons on campus. It is hard to find a henhouse, flophouse, or fieldhouse anywhere in Israel without some kind of military presence. Naturally, Eiland failed to consider the terrible implications of eliminating the distinction between civilians and the armed factions that move among them: If his logic were inverted to apply to Israeli society, where civilians are soldiers and soldiers are civilians, almost every Jewish Israeli citizen could be considered a legitimate target. Most vulnerable among the Jewish Israeli public are residents of the communities surrounding the Gaza Strip. Many of these working class development towns and kibbutzim were planted during the 1950s in place of the Palestinians who had just been forcibly expelled. In al-Majdal Asqalan, now known as Ashkelon, Jewish immigrants from the Middle East were literally trucked in to replace the Palestinians who had been held within a barbed wire enclosure before being outcasted to Gaza. Today, these largely neglected communities form a human wall against the demographic threat tucked behind a high-tech cordon sanitaire just to their south. Not only do Israel’s southern communities exist under the threat of rocket and mortar attacks from those they displaced, they are routinely used as shelters and temporary bases by the Israeli army. Renan Raz, a 26-year-old waiter and anti-occupation activist now living in Tel Aviv, remembers the anguish he experienced when the army arrived in Dorot, the southern kibbutz where he was born and raised. 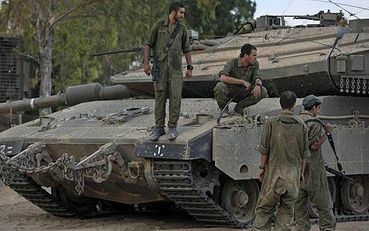 It was the height of Operation Cast Lead, the Israeli assault that left over 1400 Palestinian Gazans dead, mostly civilians, between December 2008 and January 2009.